By John Ward, a writer in the International Trade Administration’s Office of Public Affairs. Every month, two Department of Commerce bureaus, the Census Bureau and the Bureau of Economic Analysis, issue a report on U.S. international trade in goods and services known as the FT-900 release. The most recent report covers trade in July 2011. Overall, the news was good for the U.S. economy. Exports of goods and services in July increased 3.6 percent from June to $178 billion. 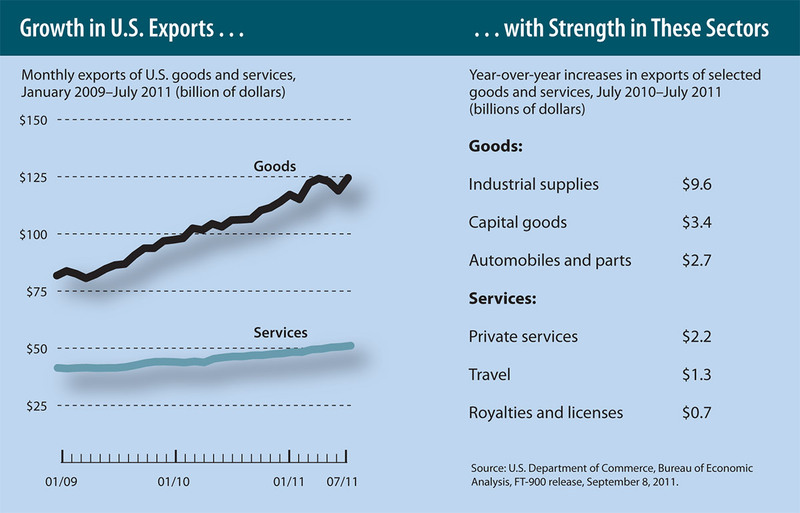 Compared to July 2010, exports of goods and services in July 2011 were up $23.4 billion, or 15.1 percent. This figure was the highest on record. Goods that showed notable increases included industrial supplies, capital goods, and automobiles. Services that showed increases included private services (such as business, professional, and technical services); travel and tourism; and royalties and license fees. To see the full report, visit www.census.gov/ft900.